We would like to see this center develop into a place of reference for first nation people within the city, a second home of sorts. 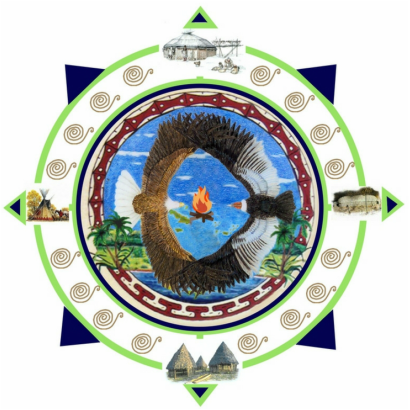 A home that promotes native community building on a conscientious collective level, and that seeks to utilize native philosophy, sustainable life skills, healing, and wellness in the largest sense of the word in order to do so. We want this place to spark pride and empowerment for first nation peoples and most importantly resonant within the minds of our youth as the future community of the Indigenous Americas. We are a registered Social Group/Community Center of First Nation People Supporting First Nation Communities. Eagle and Condor Community Center was founded in 2014 as an effort to promote, connect, highlight, and empower First Nation Communities throughout the Americas and the Caribbean. A small group people gathered together from various First Nation backgrounds: Matinnecock, Lunaape, Mexica, Cherokee, Lokono, and Taino. We all converged together one day in the late summer and expressed the love in our hearts for our First Nation Communities and the necessary need to develop more programs and services geared towards empowering and assisting all of our First Nation relations for the betterment of the next generations to come. We all agreed that First Nation people needed not only more platforms to be empowered but that we needed to be supportive of eachother's communities. So that were one succeeds we all do. We deliberated for about 3 hours in one of the center's classrooms, expressing our hopes and dreams for the center. It was a very peaceful and collaborative meeting. We ended the that first gathering by collectively clearing the community garden beds to plant for the future.